HomeBangkokFolk Thai Buddhism – Receiving blesssings and making merits. This trip is not about temple trips. It is about understanding Buddhism the way it is practiced in Thailand. Thai Buddhism is a curious blend of Buddhist teachings, taoism and local animism. This trip, you will experience up close and personal. One of Thailand's largest amulet wrapping market. Here is where you can observe how Thais choose, study and adorn their amulets. If you have heard about the magic of Thai amulets, here's the place to see these objects of veneration up close. 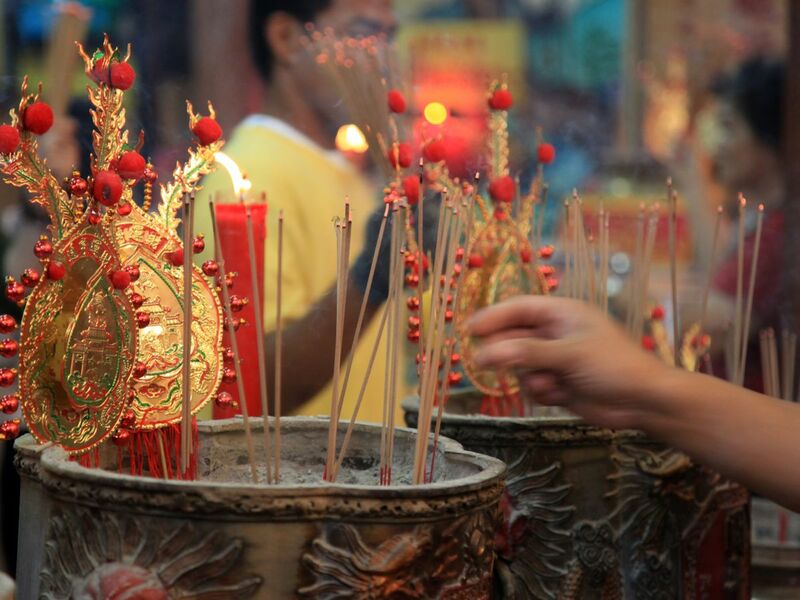 This is special for those born in the year of dragon/dog/ox/goat, where we will attend a spiritual ceremony to ward off bad luck at Wat Lengnoeiyi. In Chinese horoscope, the list of those affected by bad luck are those born in those years. Enjoy refreshing drinks and Thai dessert at the Old Siam. Here's where you can cool down the heat and enjoy traditional Thai desserts. Old Siam is also a good place to shop. Folk Buddhism is influenced by the life philosophy of Thais. While subscribing to Buddhist teachings, Thais believe in spirits and the supernatural forces that affects a person's destiny. The unique character of this fusion culture is an enigma. If you are not a fan of heat, please bring your own umbrella, sunblock, sunglasses and mini fan. Hotel Pick up is additional fee. Teerarat is fab - gteat English, very knowledgeable and believes in what she is showing you and what you are experiencing. This is not you every day tour - this is special. Great immersion into Thai- Chinese Buddhism with a terrific tour guide! Good food too ! Don’t miss this super cool tour ! A gave us a fascinating insight in the daily Buddhist traditions of the Thai Chinese, something we would have never encountered otherwise. She is extremely friendly, very knowledgeable in the subject and speaks very good English. Highly recommended.